If you thought the Constitution was brilliant wait till you see the Un-constitution. Colin Quinn’s Unconstitutional is a one man show currently available on Netflix. The basic premise involves Colin’s comedic analysis of the articles of the Constitution and the amendments. He breaks them down into modern scenarios, comparing the “now” against the original intention of the Founding Fathers. It’s a fascinating take on the most basic and fundamental foundation of the United States. And along the way, he’s shares his funny, insightful, thought-provoking and brilliant observations. 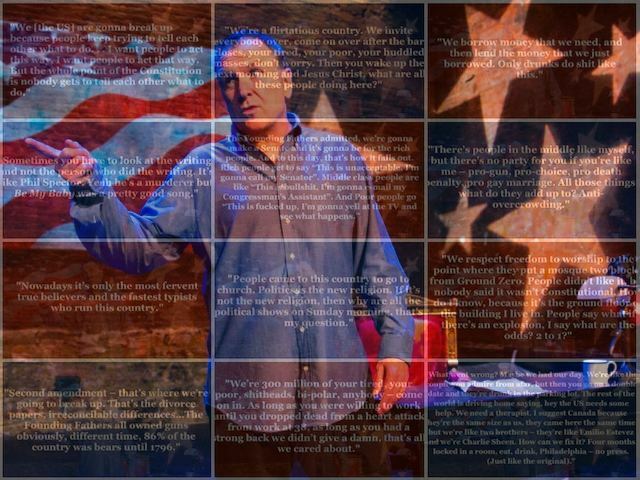 In honor of the approaching Labor Day weekend — one of our most American of holidays– enjoy some of the Constitutional (or Unconstitutional) wisdom of Colin Quinn. Colin Quinn: Unconstitutional is directed by Jay Chapman, and written and performed by Colin Quinn. Jerry Seinfeld, Mike Berkowitz, Brian Stern, Cisco Henson, Jack Vaughn, and Brian Volk-Weiss executive produced. Kieran Dotti is production supervisor for Comedy Dynamics. Comedy Dynamics is the largest independent comedy production and distribution company in North America, specializing in a range of established and emerging comedic talent.